I seem to find answers to questions in the strangest ways. The other night I was playing with Lego with my son, well maybe he was playing with me. At any rate I was looking for a particular part and I was unable to find it in the big pile of Lego on the floor. As it turns out we also have a storage unit which has the built in functionality of a sieve. It works pretty well; you dredge up pieces and shake out what you need based on size. Using this thing I was able to filter out a large majority of the pieces I didn’t need to find the ones I needed more easily. When we talk about gaining clarity in our ability to make lasting service Improvements we could look at them in a similar light. What tends to happen from time to time is that we want to know what all the answers are before we look for them, much like looking for one piece in a bucket of thousands. In our effort to prefect how we search for the answers we may hesitate or delay that search until we think we are doing it right. The trouble with doing this is that sometimes we take that much longer to take action on an initiative or in some cases never do them at all. 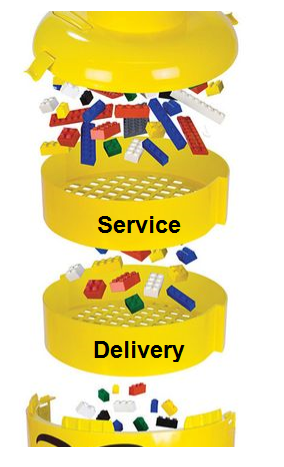 Much like with my Lego, I may shake the sieve and still not find what I am looking for. However if I remove what I no longer need and keep shaking different results will present themselves. It will be far easier to sort through what is left for my answer, rather than looking through the whole thing. In my experience I find that you need to look at the overall big picture of the service that you are trying to provide and focus on one improvement activity. While this critical success factor may have a few indicators we are still only processing a simple amount of data through our service management sieve. Once we get some consistency on the results, the inconsistencies tend to become more apparent. From they were will be able to make a strategy to make some type of improvement. Make sure that as part of the strategy that we have a timeline to perform another shake to ensure we are still on track. Consider a quarterly review, as this will allow some data to collect as well as having enough information to make an assessment. If the timeline is too quick we may not have enough data to support an appropriate decision. Depending on your organization you will know what the right size is for you. Make sure to share the results with your stakeholders so that they also know where we are making improvements as well as potentially offering some suggestions or input.